And how far we have come in the future (i.e. 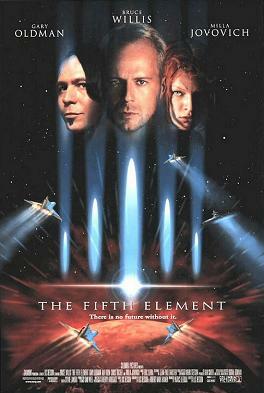 now, 2012) compared just to 1997 when The Fifth Element (IMDB / Wikipedia) portrayed a fantastic vision of days to come, yet they still had a character getting blow up in a phone booth. Light-speed-esque space travel across the galaxies, but the 2nd in command bad guy still killed a subordinate by exploding the telephone booth occupied by said subordinate. An earlier version of this post had the incorrect date. On a related note, the blog itself is set to GMT+8 Beijing Time, because I started this version of the blog (wordpress.org on my own dreamhost) following the first wordpress.com version … which is why the “Left in Front” weblog time is saying September 20th. Chicago[where I now live]‘s currently UTC/GMT -6 hours CDT – Central Daylight Time. Before we delve into my Sapporo business trip, let’s sample a cup o’ joe at a tastefully named spot I found. When we last spoke I had spent almost three weeks in the inaka and while being a d-list celebrity, getting interviewed by the local paper and partying every day was far more than I expected or deserve; I was looking forward to a brief stop in Hokkaido’s biggest city. My travel expenses were covered by work, as I was attending my “Hokkaido JET Orientation. It was held at the Akarenga, Hokkaido’s old government building. The first two days were a series of meetings mostly focused on teaching. I got tips on lesson plans, dealing with wild Japanese children who have, in the past, grabbed ALT‘s bottoms and a self-introduction activity I later used in class. The JET program has a reputation for hand-holding, and as such other topics covered included insurance, office etiquette, homesickness – workshop named “Cheer up Charlie,” which I did not appreciate – and earthquakes. My favorite parts were one, winning candy for being one of a select few teachers whose attire was up to Japanese code, and a crash course in origami. Not quite a professional yet, but maybe next week. The final day we drove to the Historical Museum of Hokkaido, which had a fascinating exhibit on the Ainus a people of Hokkaidian descent whom I hope to study more while I am here. One of the curators even gave us a private lecture on Hokkaido’s history. We also stopped at the Historical Village of Hokkaido for a bit, to take a short trip back in time and see old Japan. Aside from the scheduled events, what would a business trip be without a little networking? To that end, all Japanese Keitai are equipped with a nifty feature named “infared,” which is the 21st century version of a business card. Simply point your phone at a new friend’s and in a slightly phallic move “send” them your info whilst they “receive.” Within seconds, they have your name, phone number(s), email addresse(s) and even blood type. The definite highlight of Sapporo was sitting at a table with four gaijin dudes as we all giggled like Japanese schoolgirls infaredding each other. The roofed outdoor arcade/wonderland pictured above featured shops crammed in next to, on top of and below each other as far as the eye could see. Far more engaging, however, were the performers. There were hopeless romantics wailing away on guitar strings, break dance teams time and again rehearsing their moves, a painter exposing his mind’s eyes on a canvas and although I did not see him perform, I met a white dude, who’d been in Japan eighteen years as a juggler. To start, Monday night there was an enkai at the Kirin Beer Gardens. Fitting with Japanese culture, you cannot have a work function without some sort of party. Sadly though, that stop was a bit of a disappointment. The food, while fine, was the same lamb, bean sprouts and onions over and over again to cook at your table. The beer flowed, but not quite like wine, as I was consistently annoyed with the tardiness our servers had getting us drinks within our two hour “all you can drink” stay. The most embarrassing part, though, especially as an American trying to counteract certain sterotypes were the numerous drunk, “Ugly Americans” on display. I am not trying to be cool when I mention I have had a drink or two in my day. As such, it takes a bit to get me going crazy and yelling, it is a state of being I am careful to avoid, especially here in Japan. Unfortunately, there were quite a few, shall I say, immature drinkers in the group and within literally the first hour, were screaming at the top of their lungs and being rambunctious. I am not trying to put myself above them, but when some Japanese people see a group of over a hundred forgeiners together, and all the hear is “YEAAAH!” from across the restaurant, it kind of overshadows the quiet, respectful Americans and reinforces whatever negative opinions they happened to have about our people. ANYWAY, thankfully most of the amateurs were ready for bed by ten PM. A smaller group of us went off to a Ni-Ju-Kai, or second party, at a local club which had opened its main dance area specially for us. It too was decent, but after a bit, one of my friends and I decided this was not the scene we came to Japan for, and went off in search of something with more Japanese flavor. James, on the left, left the club with me. Jay, on the right, was distracted by an English Rose. 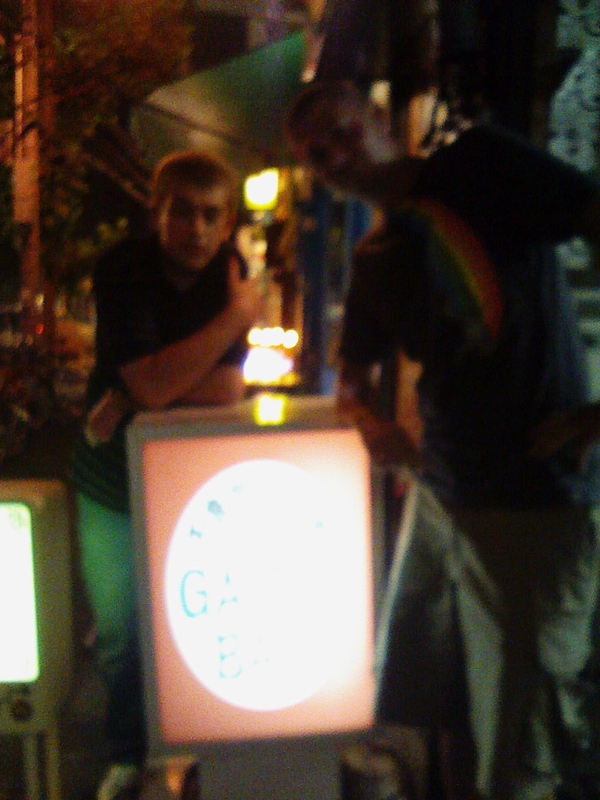 Oddly enough, after meeting a local who took it upon himself to be our official Sapporo nightlife guide, that meant going right back to the same club. Around the time the foreigners party was ending, a smaller, private party was just getting started. We were the only gaijin there, and it was exactly what we wanted. Talked to a let of people, and in the strangest of small world moments, even met someone from my adopted hometown of Hamatonbetsu. That may not sound remarkable, but it’d be like meeting someone from a 4,000 person town in rural Iowa on one of three nights out you had while visiting Chicago. “Rad Brothers” They brew their own “Rad Ale.” Had a conversation with a local headed to L.A. for a business trip about why “Guns n’ Roses” were only cool in an ironic sense these days, that got badly lost in translation, and I think I ended up offending him. “Bagus” Small bar on the second floor of a building who seats about ten people. Owner treated us like kings, giving us the finest Sake I’ve ever tasted for free, while regaling us with stories about boxing around the world. “Otakosan” Another small bar, seats 9, which was empty save the bartender and a couple. They were quite friendly though, and bought me some melt-in-your-mouth-heaven Takoyaki [*] balls. Riding the train back to my clean home (thanks to a two-beer four hour cleaning marathon I had the day before I left while listening to the Raidohead show I saw in Virginia) I fell asleep about halfway through my can of Sapporo, with Omiyage for my coworkers in tow, resting up for my first official day as a teacher, happy to have found a new city to love. I made a few corrections to the first post. All changes have been marked with strike-through text, like this. The last date of the entry was changed from 8/16/08 to 8/15/08. Also, Bonodori was misspelled, and has been corrected from Balmodori. My Flickr Photostream for Post One has been changed to correctly give credit to who took the photos, as since they are of me, I obviously did not take them. Finally, and most importantly, I would like to thank everyone who read my last post, especially those people nice enough to comment on it. UPDATE: CHICAGO (17 Oct. 2012) – Jennifer Jenkins was kind enough to point out my original Ainu link <http://www.ainu-museum.or.jp/english/english.html> was broken and gave me a wonderful replacement! Essentially slept the entire thirteen hour flight and two hour bus ride from Chicago O’Hare to the Keio Plaza Hotel. I shall let you draw your own conclusions as to my choices of how to spend my last evening in the states. Less is more, simple is beautiful and that meal is enlightenment. In the interests of time, and more importantly taste, I will skimp over the details of my first possibly nefarious evening in Tokyo. I shall only reveal that I stopped by a club owned by a world famous individual and was later offered an invitation “upstairs” by an absolutely stunning woman. First three days in Japan’s capital were spent in meetings along with hundreds of other new JETs about our new roles as cultural ambassadors and promoters of “internationalization” here in Japan. The highlight was our first “kampai!” by the President of CLAIR, which in traditional Japanese style meant staring at free booze and an insane food spread for over a half hour until the boss man was ready. One second I was walking in a pack of comfortable white people, shooting the breeze about life on top of the food chain and next thing I know, I enter a room, the name of my town is announced, and I am placed in the care of two gentlemen who barely speak English. In case you did not already know, my Japanese level was: zenzen, or nothing. Thankfully, I managed not to immediately demand a return ticket home and soon enough we were sitting over an awkward meal of tonkatsu. The man who turned out to be my supervisor was attempting to communicate something to me, which his facial expressions indicated I should understand. Thirsts quenched, we became fast friends, even if I did happen to fall asleep on the six hour car ride into my town of 4,000+. As soon as we arrived, I was whisked off to a welcome enkai of about ten people who were extremely kind to me all night, filling my glass and plate at every opportunity. It is usually said with a zest and a gleam in the eye as something is brought up that both the speaker and I now I do not really want to do, but inevitably will. That night it was about food. I eat ume, uni and natto! which is pronounced with an exclamation point at the end when served raw. Surprisingly enough, advice from my father has come in handy in these situations. 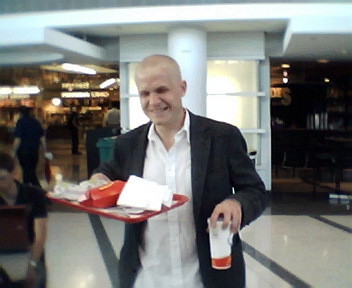 According to old man Danoff, the best thing to do is smile and comment on the delectable nature of the cuisine. All three items were absolutely gross in appearance, taste and worst of all texture, but my yellowed teeth beamed, nevertheless. As the days went by, it became apparent the first night was merely setting the table for the parties to come. 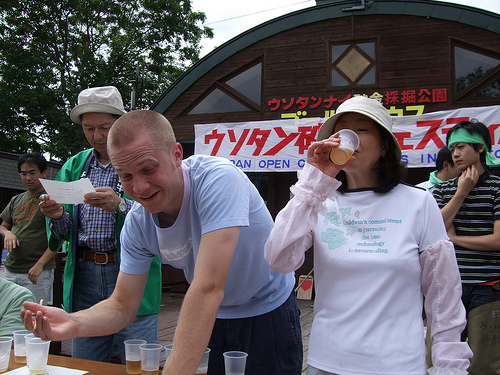 That weekend was the shrine festival, where I competed in a Sumo tournament. I would like to say I walked in there and showed them why “Made in the U.S.A.” will always trump “Made in Japan,” but there is a reason more Americans drive Toyotas than Chevrolets these days. I lost count of how many matches I lost in a row, but it was definitely over ten. My opponents ranged from a big-boned female younger than me, to a geezer pushing 70 at about half my weight, to a couple of guys around my age and size. They all tossed me to the turf. where Taiko drums lay down a centuries old beat, and people dance in a circle round and round. They feature cheap food and beer, which is always nice, and end with a big bingo game once everyone is nice and lubed. The prizes are usually practical, which is refreshing, going from daikon to laundry detergent to gohan. Friday night was my official introduction to the boy’s club at the office. Dudes-only BBQ enkai at the local lake. Although they lack rhythm and dancing, the advantage of enkais is that they feature nearly unlimited food served literally right off the grill, and kegs that seemingly never get tapped. Sat around and talked about how its a man’s world for a while, as two charcoal fueled grills were going and eat yakitori, yakisoba, yakki niku (a.k.a. Genghis Kahn) squid and my personal local favorite scallops, or hotate. The emphasis is on the “tah.” I thought about donning the nickname for the blog, before realizing that was an utterly stupid idea. Saturday was a neighborhood BBQ, with the same constant food and booze, only this time it featured women and children. Late that evening, I engaged in one my safest activities ever, as I ran around with 5 – 10 year olds and played with burning, white hot sparklers. Sunday morning I was on the top of my game for the local Gold Panning Championships. I competed, but once again fared quite poorly, coming in dead last. On a good note, I did start drinking before noon. I even was given the honor of competing in a beer tasting. I thought the purpose was to rank the beers 1 – 5. Only half way through did I discover the goal was to name the beer’s brand. Not familiar enough with the local mead nor kanji, I went 0 for 5. Went home around 1:00 for a quick nap, before manning up for a different retirement home Balmodori Bonodori-style festival. 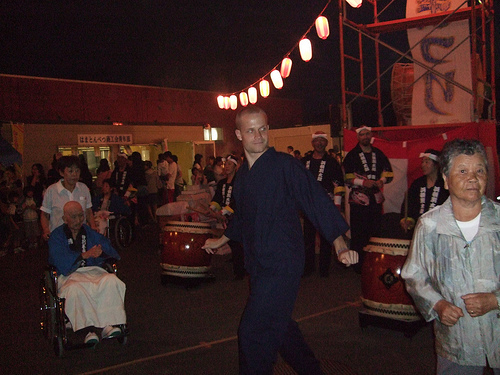 That night, I made my live Taiko debut, after only being in the club for around a week. Did not fare too well, but did get feer food and beer for my efforts, so really I won. One would think Sunday would be the end of my blissful/torturous run, but no, Monday night was the “official” office enkai. This time a BBQ in the town office parking lot, with coed staff. Needless to say, after 6 parties in 5 days, I choose not to attend the official “ni-ju-kai,” or after party. Instead I attended the more select ni-ju-kai at the local coffee shop, which doubles as a bar that stays open till 2:00, and an attractive 45-year old bartender whom I thought was max 30 when I first met her. Before you ask, this was at lunch on a weekday, and no I had not had made my first bad “it’s 5:00 somewhere joke,” yet. The following weekend of Friday the 15th, was more or less tame, with only three parties on Friday and Saturday, and Sunday off. Did manage to not completely embarrass myself at Taiko too; which is to say, I only made mistakes two out of every three notes, as opposed to each time I hit the drum. So, there could be worse introductions than partying seemingly every day. Apparently, August is the month for festivals here. I guess people need to get it out of their system, before the eight months of winter come. Aside from the social gatherings, life has had its difficulties, but overall has been fine. I have been essentially adopted by a local family, who have made several meals for me, and served as my local Japanese liaison/event coordinator/translator. Have felt like a cross between a politician and rock star, as I have been paraded around to my eight different schools and am always greeted with a round of applause for being able to speak three sentences in Japanese. Toughest times have come trying to set up my bank account and cell phone, as they required me to write my name in Japanese, which is obviously not my specialty. People were so patient with me then and always here, though, so it’s been great. Japanese hospitality is insane. Left my keys at a sushi bar, and the owner got in his car and tracked me down in town. Granted we live in an extremely small town, and foreigners literally do stand out like aliens – complete with an Alien Registration Card – but, that is a level of attention to the customer I have never before seen. In closing, you probably have forgotten and did not care to begin with, but with regards to my first night in Tokyo, I may have stretched the truth a little. The club I visited was owned by Mr. Sonic. While Sonic the Hedgehog is world-famous, Club Sega is nowhere a 23-year-old man should brag about attending. Especially considering, I had to have an attendant teach me how to play the arcade games. Also, the invitation came from a woman offering a massage. Though I could be wrong here, I do not think she really liked me for my dry-funny-once-in-a-blue-moon-sarcastic-style-of-humor. Nor my personality.